It’s common to hear stories all over the news regarding security and the internet. Companies with prestigious names and high-profile brands are being hacked and their customers’ information is being accessed without permission, thus creating a PR nightmare for the businesses and a personal feeling of mistrust and violation for their customers. According to a study by GoDaddy, 73.9% of hacked sites are hacked for SEO purposes. So, what is being done to protect our personal information every time we log on? We are all probably familiar with the HTTP or HTTPS part of a URL. But do you know the difference between the two? Hypertext transfer protocol (HTTP) is a system that is used to send and receive information through the Internet. HTTP is known as an 'application layer protocol', meaning that it is focused on how information is portrayed to the user with little concern for how the data is actually transferred from point A to point B. The “S” at the end of the “HTTPS” part of a URL means the website is secure -- HTTPS (Hypertext Transport Protocol Security). The exchange of confidential information must be secure in order to prevent access from unauthorized sources. HTTPS makes this possible. Another term that works alongside HTTPS is SSL or Secure Sockets Layer. The SSL helps encrypt information sent by website visitors, essentially activating the padlock to the HTTPS protocol, allowing secure connections from a web server to a browser. In layman’s terms, the SSL certificate is what stands between customers’ personal data on a website and hackers. Adding an SSL certificate to your website protects your users’ basic information and helps gain their trust. The terms SSL and HTTPS are frequently used interchangeably, but that is incorrect. HTTPS is only secure because it uses SSL to move data. They are two separate elements but do work together to create a secure environment. It’s now becoming an industry standard to use the HTTPS protocol on websites that handle any sensitive data, such as credit card information. Unfortunately, many companies forego the use of SSL due to both their prices and their difficult implementation. As a result, customers are starting to take notice – especially when there’s been a security breach. Including an SSL component to your website also has benefits when it comes to Search Engine Optimization (SEO). SEO is the process of getting traffic from “free,” “organic,” “editorial” or “natural” search results on search engines to visit your website. To a search engine, relevance means more than finding a page with the right words. In the early days of the web, search engines didn’t go much further than this simplistic step and search results were of limited value. Today, hundreds of factors come into play, employing mathematical algorithms to sort the relevance of the site that is a best fit for the search, ranking the findings based off a combination of relevance, authority, and trust. HTTPS offers security that many Internet users require, so it is absolutely the way to go if businesses want their website to be favored by search engines like Google, Yahoo, etc. As many companies have discovered when implementing their SEO plans, better rankings can lead to more traffic (the more people that see your site, the more visitors you’ll get). When users are looking at search results, they may see a secure site as a signal of trust and authority and visit that website over another, non-secure site, thus improving your site’s click-through-rate. In 2015, Google stated that their HTTPS ranking boost may serve as a tie breaker in the event ranking signals for two different search results are equal in everything else. Meaning, if your website is equal to your competitor’s website in terms of load speed, optimization, content freshness, etc. but your competitor’s website incorporates an SSL and yours doesn’t, Google will most likely rank theirs ahead of yours. 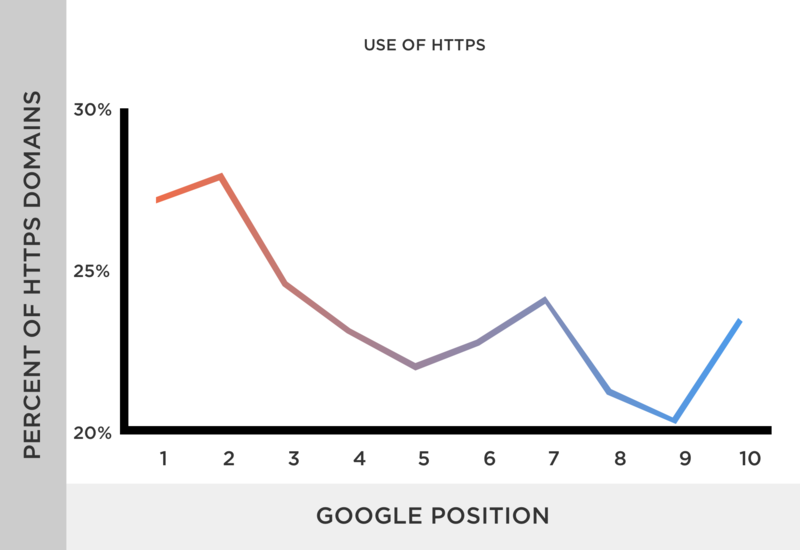 A year later, HTTPS sites made up 40% of the first page of Google search results. Google started really encouraging Webmasters to make the migration to a secure site and began giving an increasing amount of weight in ranking boosts to websites that are secure. Most recently, in July 2018, with the release of Chrome update 68, Google started tagging websites not using the HTTPS protocol as “Not Secure”. Considering Chrome is the most widely used browser, there are a lot of people that will see sites they frequent as “not secure” and they may reconsider the sites they visit or do business with. In today’s internet-driven society where the sites we visit are a common activity, we want to have a sense of security that we aren’t at risk of having our personal information compromised every time we log on. Going back to SEO, the benefits of the SSL as part of the new protocol are very clear. People want to navigate a secure site, even if the site doesn’t collect any personal information. The visual indication and confirmation that a site is secure is more than enough to leave a positive impression on visitors who may become life-long customers as a result. The web still has plenty of dangers and HTTPS may take a toll on certain sites that can’t or won’t upgrade but companies do know they have a way to give their customers a sense of trust that their connection and personal information is secure. If you aren’t sure your website is secure enough to meet today’s stringent standards, then maybe it’s time to talk with the team at Code Authority about the different options available to upgrade your site. From cloud solutions to mobile applications and digital marketing (including SEO), Code Authority works with you to understand your specific needs, develops a comprehensive plan for achieving your goals, and gives you the edge you need over the competition. Visit www.codeauthority.com today to learn more or click here for a free project estimate.